In routinely stained slides of gray matter, such as this specimen of cerebral cortex, the cell bodies of large neurons usually have conspicuous cytoplasm as well as classic "owl-eye" or "fried-egg" nuclei. 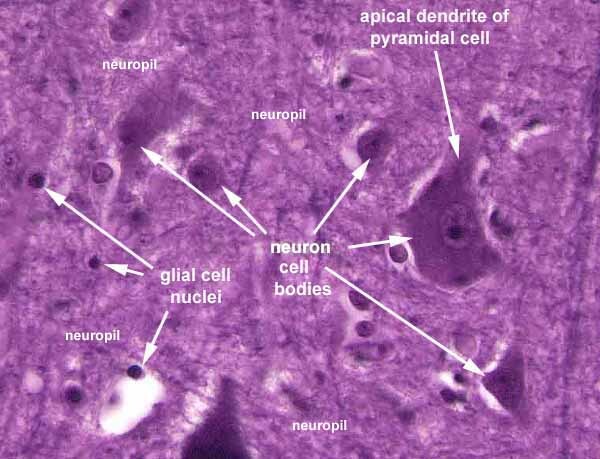 The largest cells are the principal cells whose long axons leave the local region and travel elsewhere (in this case, cortical pyramidal cells). The apical dendrite of the large pyramidal cell extends far beyond the boundary of this image. Only its base is visible here. The white "halo" commonly seen around nerve cell bodies (and blood vessels) is an artifact of histological preparation, resulting from tissue shrinkage when the central nervous tissue is fixed. Small nerve cells, the local interneurons, are generally much smaller and can be difficult to distinguish from glia. 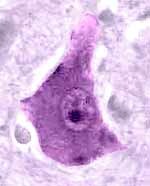 The smallest nuclei, usually without conspicuous cytoplasm, belong to glia. Distinguishing among different glial cell types is a job for experts. The background feltwork, or neuropil, consists of the many axons and dendrites of the all the nerve cells in the region. (Recall that most of the volume of a nerve cell is in its processes, not in its cell body.) Neuropil, together with glial cells, occupies most of the volume of gray matter. Visualizing axons and dendrites requires special techniques, such as the Golgi stain whose application to nerve cells was pioneered by Ramón y Cajal. Click here for an example.